In the United States, a state is a constituent political entity, of which there are currently 50. Bound together in a political union, each state holds governmental jurisdiction over a separate and defined geographic territory and shares its sovereignty with the federal government. Due to this shared sovereignty, Americans are citizens both of the federal republic and of the state in which they reside. State citizenship and residency are flexible, and no government approval is required to move between states, except for persons restricted by certain types of court orders (e.g., paroled convicts and children of divorced spouses who are sharing custody). Four states (Kentucky, Massachusetts, Pennsylvania, and Virginia) use the term commonwealth rather than state in their full official names. States are divided into counties or county-equivalents, which may be assigned some local governmental authority but are not sovereign. County or county-equivalent structure varies widely by state, and states may also create other local governments. State governments are allocated power by the people (of each respective state) through their individual constitutions. All are grounded in republican principles, and each provides for a government, consisting of three branches, each with separate and independent powers: executive, legislative, and judicial. States possess a number of powers and rights under the United States Constitution. States and their residents are represented in the United States Congress, a bicameral legislature consisting of the Senate and the House of Representatives. Each state is also entitled to select a number of electors (equal to the total number of representatives and senators from that state) to vote in the Electoral College, the body that directly elects the President of the United States. Additionally, each state has the opportunity to ratify constitutional amendments, and, with the consent of Congress, two or more states may enter into interstate compacts with one another. As sovereign entities, each of the 50 states reserves the right to organize its individual government in any way (within the broad parameters set by the U.S. Constitution) deemed appropriate by its people. As a result, while the governments of the various states share many similar features, they often vary greatly with regard to form and substance. No two state governments are identical. The government of each state is structured in accordance with its individual constitution. Many of these documents are more detailed and more elaborate than their federal counterpart. The Constitution of Alabama, for example, contains 310,296 words – more than 40 times as many as the U.S. Constitution. In practice, each state has adopted the three-branch frame of the federal government: executive, legislative, and judicial (even though doing so has never been required). In each state, the chief executive is called the governor, who serves as both head of state and head of government. All governors are chosen by direct election. The governor may approve or veto bills passed by the state legislature, as well as push for the passage of bills supported by their party. In 44 states, governors have line item veto power. Most states have a plural executive, meaning that the governor is not the only government official in the state responsible for its executive branch. In these states, executive power is distributed amongst other officials, elected by the people independently of the governor—such as the lieutenant governor, attorney general, comptroller, secretary of state, and others. The constitutions of 19 states allow for citizens to remove and replace an elected public official before the end of their term of office through a recall election. Each state follows its own procedures for recall elections, and sets its own restrictions on how often, and how soon after a general election, they may be held. In all states, the legislatures can remove state executive branch officials, including governors, who have committed serious abuses of their power from office. The process of doing so includes impeachment (the bringing of specific charges), and a trial, in which legislators act as a jury. The primary responsibilities of state legislatures are to enact state laws and appropriate money for the administration of public policy. In all states, if the governor vetoes a bill (or a portion of one), it can still become law if the legislature overrides the veto (repasses the bill) by a two-thirds vote in each chamber. In 49 of the 50 states the legislature consists of two chambers: a lower house (termed the House of Representatives, State Assembly, General Assembly or House of Delegates) and a smaller upper house, always termed the Senate. The exception is the unicameral Nebraska Legislature, which has only a single chamber. Most states have a part-time legislature (traditionally called a citizen legislature). Ten state legislatures are considered full-time; these bodies are more similar to the U.S. Congress than are the others. Members of each state's legislature are chosen by direct election. In Baker v. Carr (1962) and Reynolds v. Sims (1964), the U.S. Supreme Court held that all states are required to elect their legislatures in such a way as to afford each citizen the same degree of representation (the one person, one vote standard). In practice, most states elect legislators from single-member districts, each of which has approximately the same population. Some states, such as Maryland and Vermont, divide the state into single- and multi-member districts, in which case multi-member districts must have proportionately larger populations, e.g., a district electing two representatives must have approximately twice the population of a district electing just one. The voting systems used across the nation are: first-past-the-post in single-member districts, and multiple non-transferable vote in multi-member districts. In 2013, there were a total of 7,383 legislators in the 50 state legislative bodies. They earned from $0 annually (New Mexico) to $90,526 (California). There were various per diem and mileage compensation. States can also organize their judicial systems differently from the federal judiciary, as long as they protect the federal constitutional right of their citizens to procedural due process. Most have a trial level court, generally called a District Court, Superior Court or Circuit Court, a first-level appellate court, generally called a Court of Appeal (or Appeals), and a Supreme Court. However, Oklahoma and Texas have separate highest courts for criminal appeals. In New York State the trial court is called the Supreme Court; appeals are then taken to the Supreme Court's Appellate Division, and from there to the Court of Appeals. State court systems provide general courts with broad jurisdiction. The overwhelming majority of criminal and civil cases in the United States are heard in state courts. The annual number of cases filed in state courts are around 30,000,000 and the number of judges in state courts is about 30,000—by comparison, federal courts see some 1,000,000 filed cases with about 1700 judges. Most states base their legal system on English common law (with substantial indigenous changes and incorporation of certain civil law innovations), with the notable exception of Louisiana, a former French colony, which draws large parts of its legal system from French civil law. Only a few states choose to have the judges on the state's courts serve for life terms. In most of the states the judges, including the justices of the highest court in the state, are either elected or appointed for terms of a limited number of years, and are usually eligible for re-election or reappointment. A municipal corporation possesses and can exercise the following powers and no others: First, those granted in express words; second, those necessarily implied or necessarily incident to the powers expressly granted; third, those absolutely essential to the declared objects and purposes of the corporation-not simply convenient but indispensable; fourth, any fair doubt as to the existence of a power is resolved by the courts against the corporation-against the existence of the powers. Personnel – authority to set employment rules, remuneration rates, employment conditions and collective bargaining. Each state admitted to the Union by Congress since 1789 has entered it on an equal footing with the original States in all respects. With the growth of states' rights advocacy during the antebellum period, the Supreme Court asserted, in Lessee of Pollard v. Hagan (1845), that the Constitution mandated admission of new states on the basis of equality. With the consent of Congress, states may enter into interstate compacts, agreements between two or more states. Compacts are frequently used to manage a shared resource, such as transportation infrastructure or water rights. Under Article IV of the Constitution, which outlines the relationship between the states, each state is required to give full faith and credit to the acts of each other's legislatures and courts, which is generally held to include the recognition of most contracts and criminal judgments, and before 1865, slavery status. Under the Extradition Clause, a state must extradite people located there who have fled charges of "treason, felony, or other crimes" in another state if the other state so demands. The principle of hot pursuit of a presumed felon and arrest by the law officers of one state in another state are often permitted by a state. The full faith and credit expectation does have exceptions, some legal arrangements, such as professional licensure and marriages, may be state-specific, and until recently states have not been found by the courts to be required to honor such arrangements from other states. Such legal acts are nevertheless often recognized state-to-state according to the common practice of comity. States are prohibited from discriminating against citizens of other states with respect to their basic rights, under the Privileges and Immunities Clause. Under Article IV, each state is guaranteed a form of government that is grounded in republican principles, such as the consent of the governed. This guarantee has long been at the fore-front of the debate about the rights of citizens vis-à-vis the government. States are also guaranteed protection from invasion, and, upon the application of the state legislature (or executive, if the legislature cannot be convened), from domestic violence. This provision was discussed during the 1967 Detroit riot, but was not invoked. The Supremacy Clause (Article VI, Clause 2) establishes that the Constitution, federal laws made pursuant to it, and treaties made under its authority, constitute the supreme law of the land. It provides that state courts are bound by the supreme law; in case of conflict between federal and state law, the federal law must be applied. Even state constitutions are subordinate to federal law. States' rights are understood mainly with reference to the Tenth Amendment. The Constitution delegates some powers to the national government, and it forbids some powers to the states. The Tenth Amendment reserves all other powers to the states, or to the people. Powers of the U.S Congress are enumerated in Article I, Section 8, for example, the power to declare war. Making treaties is one power forbidden to the states, being listed among other such powers in Article I, Section 10. Among the Article I enumerated powers of Congress is the power to regulate Commerce. Since the early 20th century, the Supreme Court's interpretation of this "Commerce Clause" has, over time, greatly expanded scope of federal power, at the expense of powers formerly considered purely states' matters. The Cambridge Economic History of the United States says, "On the whole, especially after the mid-1880s, the Court construed the Commerce Clause in favor of increased federal power." In 1941, the Supreme Court in U.S. v. Darby upheld the Fair Labor Standards Act of 1938, holding that Congress had the power under the Commerce Clause to regulate employment conditions. Then, one year later, in Wickard v. Filburn, the Court expanded federal power to regulate the economy by holding that federal authority under the commerce clause extends to activities which may appear to be local in nature but in reality effect the entire national economy and are therefore of national concern. For example, Congress can regulate railway traffic across state lines, but it may also regulate rail traffic solely within a state, based on the reality that intrastate traffic still affects interstate commerce. Through such decisions, argues law professor David F. Forte, "the Court turned the commerce power into the equivalent of a general regulatory power and undid the Framers' original structure of limited and delegated powers." Subsequently, Congress invoked the Commerce Clause to expand federal criminal legislation, as well as for social reforms such as the Civil Rights Act of 1964. Only within the past couple of decades, through decisions in cases such as those in U.S. v. Lopez (1995) and U.S. v. Morrison (2000), has the Court tried to limit the Commerce Clause power of Congress. Another enumerated congressional power is its power is its taxing and spending power. An example of this is the system of federal aid for highways, which include the Interstate Highway System. The system is mandated and largely funded by the federal government, and also serves the interests of the states. By threatening to withhold federal highway funds, Congress has been able to pressure state legislatures to pass a variety of laws. An example is the nationwide legal drinking age of 21, enacted by each state, brought about by the National Minimum Drinking Age Act. Although some objected that this infringes on states' rights, the Supreme Court upheld the practice as a permissible use of the Constitution's Spending Clause in South Dakota v. Dole 483 U.S. 203 (1987). As prescribed by Article I of the Constitution, which establishes the U.S. Congress, each state is represented in the Senate (irrespective of population size) by two senators, and each is guaranteed at least one representative in the House. Both senators and representatives are chosen in direct popular elections in the various states. (Prior to 1913, senators were elected by state legislatures.) There are presently 100 senators, who are elected at-large to staggered terms of six years, with one-third of them being chosen every two years. Representatives are elected at-large or from single-member districts to terms of two years (not staggered). The size of the House—presently 435 voting members—is set by federal statute. Seats in the House are distributed among the states in proportion to the most recent constitutionally mandated decennial census. The borders of these districts are established by the states individually through a process called redistricting, and within each state all districts are required to have approximately equal populations. Citizens in each state plus those in the District of Columbia indirectly elect the president and vice president. When casting ballots in presidential elections they are voting for presidential electors, who then, using procedures provided in the 12th amendment, elect the president and vice president. There were 538 electors for the most recent presidential election in 2016; the allocation of electoral votes was based on the 2010 census. Each state is entitled to a number of electors equal to the total number of representatives and senators from that state; the District of Columbia is entitled to three electors. While the Constitution does set parameters for the election of federal officials, state law, not federal, regulates most aspects of elections in the U.S., including: primaries, the eligibility of voters (beyond the basic constitutional definition), the running of each state's electoral college, as well as the running of state and local elections. All elections—federal, state and local—are administered by the individual states, and some voting rules and procedures may differ among them. Article V of the Constitution accords states a key role in the process of amending the U.S. Constitution. Amendments may be proposed either by Congress with a two-thirds vote in both the House and the Senate, or by a convention of states called for by two-thirds of the state legislatures. To become part of the Constitution, an amendment must be ratified by either—as determined by Congress—the legislatures of three-quarters of the states or state ratifying conventions in three-quarters of the states. The vote in each state (to either ratify or reject a proposed amendment) carries equal weight, regardless of a state's population or length of time in the Union. Article IV also grants to Congress the authority to admit new states into the Union. Since the establishment of the United States in 1776, the number of states has expanded from the original 13 to 50. Each new state has been admitted on an equal footing with the existing states. It also forbids the creation of new states from parts of existing states without the consent of both the affected states and Congress. This caveat was designed to give Eastern states that still had Western land claims (including Georgia, North Carolina, and Virginia), to have a veto over whether their western counties could become states, and has served this same function since, whenever a proposal to partition an existing state or states in order that a region within might either join another state or to create a new state has come before Congress. Most of the states admitted to the Union after the original 13 were formed from an organized territory established and governed by Congress in accord with its plenary power under Article IV, Section 3, Clause 2. The outline for this process was established by the Northwest Ordinance (1787), which predates the ratification of the Constitution. In some cases, an entire territory has become a state; in others some part of a territory has. When the people of a territory make their desire for statehood known to the federal government, Congress may pass an enabling act authorizing the people of that territory to organize a constitutional convention to write a state constitution as a step towards admission to the Union. Each act details the mechanism by which the territory will be admitted as a state following ratification of their constitution and election of state officers. Although the use of an enabling act is a traditional historic practice, a number of territories have drafted constitutions for submission to Congress absent an enabling act and were subsequently admitted. Upon acceptance of that constitution, and upon meeting any additional Congressional stipulations, Congress has always admitted that territory as a state. California, 1850, from land ceded to the United States by Mexico in 1848 under the terms of the Treaty of Guadalupe Hidalgo. Congress is under no obligation to admit states, even in those areas whose population expresses a desire for statehood. Such has been the case numerous times during the nation's history. In one instance, Mormon pioneers in Salt Lake City sought to establish the state of Deseret in 1849. It existed for slightly over two years and was never approved by the United States Congress. In another, leaders of the Five Civilized Tribes (Cherokee, Chickasaw, Choctaw, Creek, and Seminole) in Indian Territory proposed to establish the state of Sequoyah in 1905, as a means to retain control of their lands. The proposed constitution ultimately failed in the U.S. Congress. Instead, the Indian Territory, along with Oklahoma Territory were both incorporated into the new state of Oklahoma in 1907. The first instance occurred while the nation still operated under the Articles of Confederation. The State of Franklin existed for several years, not long after the end of the American Revolution, but was never recognized by the Confederation Congress, which ultimately recognized North Carolina's claim of sovereignty over the area. The territory comprising Franklin later became part of the Southwest Territory, and ultimately the state of Tennessee. Additionally, the entry of several states into the Union was delayed due to distinctive complicating factors. Among them, Michigan Territory, which petitioned Congress for statehood in 1835, was not admitted to the Union until 1837, due to a boundary dispute with the adjoining state of Ohio. The Republic of Texas requested annexation to the United States in 1837, but fears about potential conflict with Mexico delayed the admission of Texas for nine years. Statehood for Kansas Territory was held up for several years (1854–61) due to a series of internal violent conflicts involving anti-slavery and pro-slavery factions. West Virginia's bid for statehood was also delayed over slavery, and was settled when it agreed to adopt a gradual abolition plan. Puerto Rico referred to itself as the "Commonwealth of Puerto Rico" in the English version of its constitution, and as "Estado Libre Asociado" (literally, Associated Free State) in the Spanish version. As with any non-state territory of the United States, its residents do not have voting representation in the federal government. Puerto Rico has limited representation in Congress in the form of a Resident Commissioner, a delegate with limited voting rights in the Committee of the Whole House on the State of the Union, and no voting rights otherwise. A non-binding referendum on statehood, independence, or a new option for an associated territory (different from the current status) was held on November 6, 2012. Sixty one percent (61%) of voters chose the statehood option, while one third of the ballots were submitted blank. On December 11, 2012, the Legislative Assembly of Puerto Rico enacted a concurrent resolution requesting the President and the Congress of the United States to respond to the referendum of the people of Puerto Rico, held on November 6, 2012, to end its current form of territorial status and to begin the process to admit Puerto Rico as a State. Another status referendum was held on June 11, 2017, in which 97% percent of voters chose statehood. Turnout was low, as only 23% of voters went to the polls, with advocates of both continued territorial status and independence urging voters to boycott it. On June 27, 2018, the H.R. 6246 Act was introduced on the U.S. House with the purpose of respond to, and comply with, the democratic will of the United States citizens residing in Puerto Rico as expressed in the plebiscites held on November 6, 2012, and June 11, 2017, by setting forth the terms for the admission of the territory of Puerto Rico as a State of the Union. The act has 37 original cosponsors between Republicans and Democrats in the U.S. House of Representatives. The intention of the Founding Fathers was that the United States capital should be at a neutral site, not giving favor to any existing state; as a result, the District of Columbia was created in 1800 to serve as the seat of government. As it is not a state, the district does not have representation in the Senate and has a non-voting delegate in the House; neither does it have a sovereign elected government. Additionally, prior to ratification of the 23rd Amendment in 1961, district citizens did not get the right to vote in Presidential elections. Some residents of the District support statehood of some form for that jurisdiction – either statehood for the whole district or for the inhabited part, with the remainder remaining under federal jurisdiction. In November 2016, Washington, D.C. residents voted in a statehood referendum in which 86% of voters supported statehood for Washington, D.C. For statehood to be achieved, it must be approved by Congress and signed by the President. Other possible new states are Guam and the U.S. Virgin Islands, both of which are unincorporated organized territories of the United States. Also, either the Northern Mariana Islands or American Samoa, an unorganized, unincorporated territory, could seek statehood. The Constitution is silent on the issue of whether a state can secede from the Union. Its predecessor, the Articles of Confederation, stated that the United States "shall be perpetual." The question of whether or not individual states held the unilateral right to secession was a passionately debated feature of the nations's political discourse from early in its history, and remained a difficult and divisive topic until the American Civil War. In 1860 and 1861, 11 southern states each declared secession from the United States, and joined together to form the Confederate States of America (CSA). Following the defeat of Confederate forces by Union armies in 1865, those states were brought back into the Union during the ensuing Reconstruction Era. The federal government never recognized the sovereignty of the CSA, or the validity of the ordinances of secession adopted by the seceding states. Following the war, the United States Supreme Court, in Texas v. White (1869), held that states did not have the right to secede and that any act of secession was legally void. Drawing on the Preamble to the Constitution, which states that the Constitution was intended to "form a more perfect union" and speaks of the people of the United States in effect as a single body politic, as well as the language of the Articles of Confederation, the Supreme Court maintained that states did not have a right to secede. However, the court's reference in the same decision to the possibility of such changes occurring "through revolution, or through consent of the States," essentially means that this decision holds that no state has a right to unilaterally decide to leave the Union. Four states – Kentucky, Massachusetts, Pennsylvania, and Virginia – adopted constitutions early in their post-colonial existence identifying themselves as commonwealths, rather than states. These commonwealths are states, but legally, each is a commonwealth because the term is contained in its constitution. As a result, "commonwealth" is used in all public and other state writings, actions or activities within their bounds. The term, which refers to a state in which the supreme power is vested in the people, was first used in Virginia during the Interregnum, the 1649–60 period between the reigns of Charles I and Charles II during which parliament's Oliver Cromwell as Lord Protector established a republican government known as the Commonwealth of England. Virginia became a royal colony again in 1660, and the word was dropped from the full title. When Virginia adopted its first constitution on June 29, 1776, it was reintroduced. Pennsylvania followed suit when it drew up a constitution later that year, as did Massachusetts, in 1780, and Kentucky, in 1792. The U.S. territories of the Northern Marianas and Puerto Rico are also referred to as commonwealths. This designation does have a legal status different from that of the 50 states. Both of these commonwealths are unincorporated territories of the United States. The 50 states have taken their names from a wide variety of languages. Twenty-four state names originate from Native American languages. Of these, eight are from Algonquian languages, seven are from Siouan languages, three are from Iroquoian languages, one is from Uto-Aztecan languages and five others are from other indigenous languages. Hawaii's name is derived from the Polynesian Hawaiian language. Of the remaining names, 22 are from European languages: Seven from Latin (mainly Latinized forms of English names), the rest are from English, Spanish and French. Eleven states are named after individual people, including seven named for royalty and one named after a President of the United States. The origins of six state names are unknown or disputed. Several of the states that derive their names from (corrupted) names used for Native peoples, have retained the plural ending of "s". The borders of the 13 original states were largely determined by colonial charters. Their western boundaries were subsequently modified as the states ceded their western land claims to the Federal government during the 1780s and 1790s. Many state borders beyond those of the original 13 were set by Congress as it created territories, divided them, and over time, created states within them. Territorial and new state lines often followed various geographic features (such as rivers or mountain range peaks), and were influenced by settlement or transportation patterns. At various times, national borders with territories formerly controlled by other countries (British North America, New France, New Spain including Spanish Florida, and Russian America) became institutionalized as the borders of U.S. states. In the West, relatively arbitrary straight lines following latitude and longitude often prevail, due to the sparseness of settlement west of the Mississippi River. Once established, most state borders have, with few exceptions, been generally stable. Only two states, Missouri (Platte Purchase) and Nevada, grew appreciably after statehood. Several of the original states ceded land, over a several year period, to the Federal government, which in turn became the Northwest Territory, Southwest Territory, and Mississippi Territory. In 1791 Maryland and Virginia ceded land to create the District of Columbia (Virginia's portion was returned in 1847). In 1850, Texas ceded a large swath of land to the federal government. Additionally, Massachusetts and Virginia (on two occasions), have lost land, in each instance to form a new state. There have been numerous other minor adjustments to state boundaries over the years due to improved surveys, resolution of ambiguous or disputed boundary definitions, or minor mutually agreed boundary adjustments for administrative convenience or other purposes. Occasionally, either Congress or the U.S. Supreme Court has had to settle state border disputes. One notable example is the case New Jersey v. New York, in which New Jersey won roughly 90% of Ellis Island from New York in 1998. 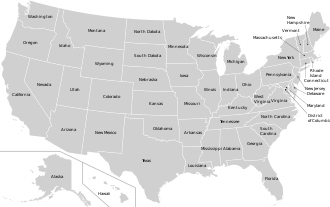 States may be grouped in regions; there are many variations and possible groupings. Many are defined in law or regulations by the federal government. For example, the United States Census Bureau defines four statistical regions, with nine divisions. The Census Bureau region definition is "widely used … for data collection and analysis," and is the most commonly used classification system. Other multi-state regions are unofficial, and defined by geography or cultural affinity rather than by state lines. ^ "Annual Estimates of the Resident Population: April 1, 2010 to July 1, 2017". Washington, D.C.: U.S. Census Bureau, Population Division. December 2017. Archived from the original on April 9, 2018. Retrieved March 14, 2018. ^ "State Area Measurements and Internal Point Coordinates". Washington, D.C.: U.S. Census Bureau. Archived from the original on March 16, 2018. Retrieved March 14, 2018. ^ Erler, Edward. "Essays on Amendment XIV: Citizenship". The Heritage Foundation. Archived from the original on July 24, 2017. Retrieved January 12, 2016. ^ "Frequently Asked Questions About the Minnesota Legislature". Minnesota State Legislature. Archived from the original on October 21, 2013. Retrieved January 12, 2016. ^ a b c Pavković, Aleksandar; Radan, Peter (2007). Creating New States: Theory and Practice of Secession. Ashgate Publishing. p. 222. ISBN 978-0-7546-7163-3. Archived from the original on November 20, 2015. Retrieved March 14, 2018. ^ "Texas v. White 74 U.S. 700 (1868)". Mountain View, California: Justia. Archived from the original on March 4, 2016. Retrieved January 12, 2016. ^ a b "State & Local Government". whitehouse.gov. Washington, D.C.: The White House. Retrieved October 30, 2018. ^ a b c "Separation of Powers--Executive Veto Powers". National Conference of State Legislatures. Archived from the original on February 28, 2018. Retrieved March 12, 2018. ^ Regalado, Daniel M. "The Texas Plural Executive". Texas Government (Chapter 4). Lumen Learning. Archived from the original on March 14, 2018. Retrieved March 12, 2018. ^ a b "Recall of State Officials". National Conference of State Legislatures. Archived from the original on March 31, 2018. Retrieved March 12, 2018. ^ "History of the Nebraska Unicameral: The Birth of a Unicameral". Lincoln, Nebraska: Nebraska Legislature. Archived from the original on March 4, 2018. Retrieved March 12, 2018. ^ "Full- and Part-time Legislatures". National Conference of State Legislatures. Archived from the original on March 7, 2018. Retrieved March 12, 2018. ^ Wilson, Reid (August 23, 2013). "GovBeat:For legislators, salaries start at zero". Washington Post. Washington, DC. pp. A2. Archived from the original on August 25, 2013. Retrieved August 26, 2013. ^ "Federal vs. State Courts - Key Differences - FindLaw". Findlaw. Archived from the original on May 14, 2018. Retrieved May 14, 2018. ^ "Unitary system". Encyclopædia Britannica, Inc. Archived from the original on October 9, 2016. Retrieved August 13, 2016. ^ Dean, Kenneth d. (1976). "The Dillon Rule -- A limit on Local Government Powers". Missouri Law Review. 41 (4): 548. Archived from the original on October 9, 2016. Retrieved August 13, 2016. ^ "Local Government Authority". National League of Cities. Archived from the original on August 4, 2016. Retrieved August 13, 2016. ^ a b Forte, David F. "Essays on Article IV: New States Clause". The Heritage Guide to the Constitution. The Heritage Foundation. Archived from the original on July 24, 2017. Retrieved January 12, 2016. ^ a b "Doctrine of the Equality of States". Justia.com. Archived from the original on October 19, 2012. Retrieved January 30, 2012. ^ deGolian, Crady. "Interstate Compacts: Background and History". Council on State Governments. Archived from the original on September 27, 2013. Retrieved September 25, 2013. ^ "Hot Pursuit Law & Legal Definition". USLegal, Inc. Archived from the original on October 9, 2014. Retrieved October 8, 2014. ^ Adam Liptak (March 17, 2004). "Bans on Interracial Unions Offer Perspective on Gay Ones". New York Times. Archived from the original on May 25, 2017. Retrieved February 20, 2017. ^ Ernest B. Abbott; Otto J. Hetzel (2010). Homeland Security and Emergency Management: A Legal Guide for State and Local Governments. American Bar Association. p. 52. ISBN 9781604428179. ^ Cornell University Law School. "Supremacy Clause". law.cornell.edu. Archived from the original on February 1, 2018. Retrieved February 21, 2018. ^ Burnham, William (2006). Introduction to the Law and Legal System of the United States, 4th ed. St. Paul: Thomson West. p. 41. ^ Stanley Lewis Engerman (2000). The Cambridge economic history of the United States: the colonial era. Cambridge University Press. p. 464. ISBN 978-0-521-55307-0. ^ "United States v. Darby, 312 U.S. 100 (1941)". justia.com. Mountain View, California: Justia. Retrieved October 30, 2018. ^ David Shultz (2005). Encyclopedia of the Supreme Court. Infobase Publishing. p. 522. ISBN 978-0-8160-5086-4. ^ Forte, David F. "Essays on Article I: Commerce among the States". Heritage Guide to the Constitution. Heritage Foundation. Retrieved October 30, 2018. ^ "Constitution of the United States, Article I, Section 8". Legal Information Institute, Cornell University Law School. Archived from the original on October 19, 2015. Retrieved October 17, 2015. ^ Kristin D. Burnett. "Congressional Apportionment (2010 Census Briefs C2010BR-08)" (PDF). U.S. Department of Commerce, Economics and Statistics Administration. Archived (PDF) from the original on November 19, 2011. Retrieved December 11, 2017. ^ Levitt, Justin. "Who draws the lines". All About Redistricting. Los Angeles, California: University of Loyola Law School. Archived from the original on June 17, 2018. Retrieved June 17, 2018. ^ Fried, Charles. "Essays on Amendment XII: Electoral College". Heritage Guide to the Constitution. Heritage Foundation. Retrieved October 30, 2018. ^ "The 2016 Presidential Election: Provisions of the Constitution and United States Code" (PDF). Washington, D.C.: Office of the Federal Register, U.S. National Archives and Records Administration. February 2018. p. 6. Retrieved October 30, 2018. ^ Whitaker, L. Paige; Neale, Thomas H. (November 5, 2004) [January 16, 2001]. "The Electoral College: An Overview and Analysis of Reform Proposals" (PDF). Washington, D.C.: Congressional Research Service, The Library of Congress. Retrieved October 30, 2018 – via UNT Libraries Government Documents Department; UNT Digital Library. ^ "Elections & Voting". whitehouse.gov. Washington, D.C.: The White House. Retrieved October 30, 2018. ^ "The Constitutional Amendment Process". The U.S. National Archives and Records Administration. Archived from the original on November 21, 2015. Retrieved November 17, 2015. ^ Wines, Michael (August 22, 2016). "Inside the Conservative Push for States to Amend the Constitution". NYT. Archived from the original on August 23, 2016. Retrieved August 24, 2016. ^ "Property and Territory: Powers of Congress". Justia.com. Archived from the original on May 25, 2017. Retrieved April 8, 2016. ^ a b c d e f Stein, Mark (2008). How the States Got Their Shapes. New York: HarperCollins. pp. xvi, 334. ISBN 9780061431395. ^ a b c d e f "Official Name and Status History of the several States and U.S. Territories". TheGreenPapers.com. Archived from the original on August 14, 2009. Retrieved April 8, 2016. ^ "California Admission Day September 9, 1850". CA.gov. California Department of Parks and Recreation. Archived from the original on March 28, 2016. Retrieved April 8, 2016. ^ a b c Riccards, Michael P. (Summer 1997). "Lincoln and the Political Question: The Creation of the State of West Virginia". Presidential Studies Quarterly. 27 (3). Retrieved October 30, 2018 – via questia.com. ^ "The 14th State". Vermont History Explorer. Vermont Historical Society. Archived from the original on December 21, 2015. Retrieved April 8, 2016. ^ "A State of Convenience: The Creation of West Virginia, Chapter Twelve, Reorganized Government of Virginia Approves Separation". Wvculture.org. West Virginia Division of Culture and History. Archived from the original on March 3, 2016. Retrieved April 8, 2016. ^ "Museum of the Red River - The Choctaw". Museum of the Red River. 2005. Archived from the original on June 15, 2009. Retrieved August 4, 2009. ^ Winders, Richard Bruce (2002). Crisis in the Southwest: the United States, Mexico, and the Struggle over Texas. Rowman & Littlefield. pp. 82, 92. ISBN 978-0-8420-2801-1. Retrieved October 30, 2018 – via Google Books. ^ "Rules of the House of Representatives" (PDF). Archived from the original (PDF) on May 28, 2010. Retrieved July 25, 2010. ^ "Puerto Ricans favor statehood for first time". CNN. November 7, 2012. Archived from the original on October 6, 2014. Retrieved October 8, 2014. ^ "Puerto Ricans opt for statehood". Fox News. Archived from the original on October 7, 2014. Retrieved October 8, 2014. ^ "The Senate and the House of Representative of Puerto Rico Concurrent Resolution" (PDF). puertoricoreport.org. Archived (PDF) from the original on March 20, 2013. Retrieved December 15, 2012. ^ "23% of Puerto Ricans Vote in Referendum, 97% of Them for Statehood". nytimes.com. Archived from the original on June 12, 2017. Retrieved June 14, 2017. ^ Congress.Gov (July 7, 2018). "To enable the admission of the territory of Puerto Rico into the Union as a State, and for other purposes". www.congress.gov. Archived from the original on July 7, 2018. Retrieved July 7, 2018. ^ Congress.Gov (July 7, 2018). "Cosponsors: H.R.6246 — 115th Congress (2017-2018)". www.congress.gov. Archived from the original on July 7, 2018. Retrieved July 7, 2018. ^ "DC Voters Elect Gray to Council, Approve Statehood Measure". nbcwashington.com. Archived from the original on November 9, 2016. Retrieved June 14, 2017. ^ "How do new states become part of the U.S.?". howstuffworks.com. December 3, 2012. Archived from the original on September 3, 2017. Retrieved June 14, 2017. ^ a b "Texas v. White". Cornell Law School, Ithaca, New York: Legal Information Institute. Archived from the original on March 13, 2018. Retrieved March 14, 2018. ^ a b "Why is Massachusetts a Commonwealth?". Mass.Gov. Commonwealth of Massachusetts. 2016. Archived from the original on March 15, 2016. Retrieved March 10, 2016. ^ Salmon, Emily J.; Edward D. C. Campbell, Jr., eds. (1994). The Hornbook of Virginia History (4th ed.). Richmond, VA: Virginia Office of Graphic Communications. p. 88. ISBN 978-0-88490-177-8. Archived from the original on March 4, 2016. Retrieved March 10, 2016. ^ Greenhouse, Linda (May 27, 1998). "The Ellis Island Verdict: The Ruling; High Court Gives New Jersey Most of Ellis Island". The New York Times. Archived from the original on November 15, 2012. Retrieved August 2, 2012. ^ United States Census Bureau, Geography Division. "Census Regions and Divisions of the United States" (PDF). Archived (PDF) from the original on March 4, 2016. Retrieved January 10, 2013. This page is based on the Wikipedia article U.S. state; it is used under the Creative Commons Attribution-ShareAlike 3.0 Unported License (CC-BY-SA). You may redistribute it, verbatim or modified, providing that you comply with the terms of the CC-BY-SA.